When Tish and I get into the Peace Corps we will be in a poorer, developing nation. There will probably not be a dropzone nearby, so my skydiving will have to come to an end. I have accepted this and have sold my gear and stopped jumping. The gear sold a LOT faster than I had thought it would, or I would be jumping still, but it is what it is. Just as we could not wait until the last minute to sell the house, I had to go ahead and sell my gear because I did not know how long it would take. I was ready to step away from skydiving mainly because I had done so much in the sport already. I had tried almost every discipline: Formation Skydiving, Freefly Skydiving, Wingsuits, Coaching, etc. I jumped at Drop Zones in California, Arizona, Florida, Georgia, North Carolina, South Carolina and Puerto Rico. I did a lot of fun and crazy jumps too. I even jumped naked once (and have the video to prove it). My favorite discipline was flying my wingsuit and had become good enough to be invited into the world record jump in November 2009. I sort of felt like I had “done it all” and was ok with retiring from the sport. I also jumped long enough to have had a few broken bones and to have seen some friends die. It is a dangerous sport. As I write this, it has been four weeks since my last jump. It is Saturday and if I had not quit, I would probably be a the DZ right now jumping. Someone once told me that quitting isn’t bad once you have gone through the “adrenalin withdrawal.” I think I am through that. The times that I miss it the most and will always miss it are on those warm summer days when there are huge billowy clouds all over the sky. I miss being up there with them. I have flown my wingsuit and my parachute around, near and through those beautiful clouds. 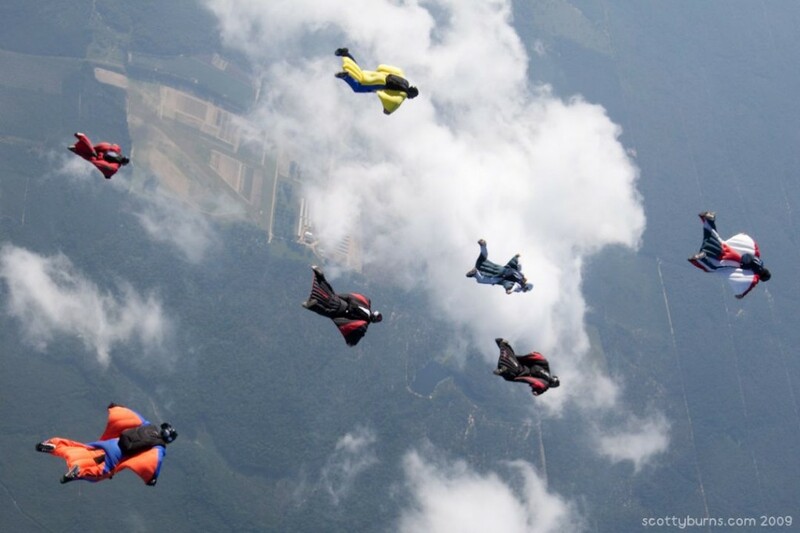 I have seen what skydiver’s all “The Glory” many times. That is when you approach a cloud with the sun at your back and see your shadow on the cloud with a perfect circle of rainbow surrounding it. Also I will miss the friendships. The thing that absolutely surprised me the most about skydiving is that it is not just about hurling yourself out of an airplane at 14,000 feet. It is even more about the relationships you make with others as you share this VERY unique pastime. I know I can go back to the DZ and say hello, but I need to wait for awhile before I do that, to be sure my addiction is totally broken. I made a total of 806 jumps. Really I made 807 if you include my very first jump which I made at age 18. I usually don’t include that one because I don’t have the log book entry (proof). It was my only jump using a “round”, a ParaCommander round parachute. I wrote another long post about my last skydive, if you would like to read it, click HERE. Hey Marion! Just stumbled across this when googling “Georgia Tech skydivers” and your image popped up. Hope you’re having fun in Botswana- I’m sure you’re doing good work. See ya round!